B2C e-commerce implementation can be overwhelming as it is a major undertaking entailing the entire value chain which is a full range of activities that a company must perform to deliver its products and services to the market. Therefore, I believe a structured approach is needed to stay on the right track from the beginning and value chain analysis is one of the tools that can help system implementors do just that. Following Porter's value chain concept but strictly focusing on e-commerce, business activities in e-commerce value chain can be split into 2 categories: primary and support. Product management - includes all activities required to bring products to the online store such as setting up product catalog, categorizing, adding or removing products, enriching and displaying products online, configuring product pricing and managing inventory. driving web traffics through promotions and various marketing activities via search, display advertising, email, social, affiliates, and referrals. optimizing the user experience for conversion with UI/UX, personalization, product recommendation leveraging actionable insights from Web analytics. Sales - includes all activities related to facilitating online sales by empowering customers to discover products, learn about the products and transact. Order fulfillment - includes all activities related to receiving, processing and delivering to consumers who place orders online. Customer services - includes all activities related to facilitating interactions with consumers through various channels to address their inquiries, listen to their voices and perform their service requests such as order modification, cancel, exchange and return. Account & Finance - mainly refers to sales and payment reconciliation related to e-commerce. IT - includes those related to hosting and application support. Below diagram depicts a reference value chain for B2C Episerver Commerce implementation. In management consulting, value chain analysis is used to identify and analyze primary and support activities in order to optimize business operations for maximum efficiency and profitability. Therefore, I used this technique quite extensively in my past life as a consultant. 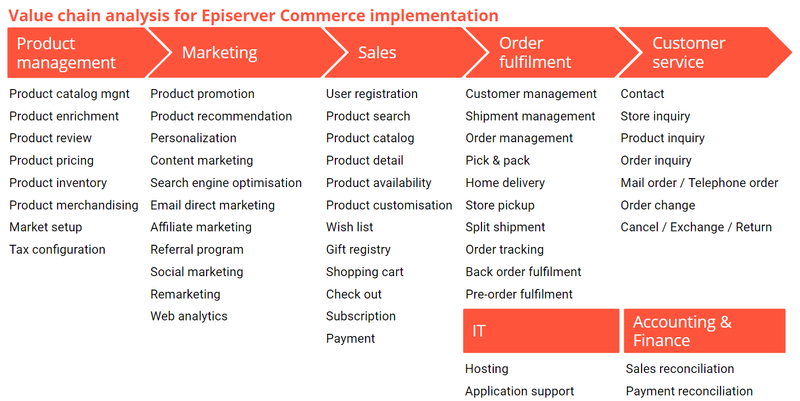 However, when taking on Solution Architect role, I find that value chain analysis is also very effective in Episerver commerce implementation, especially in the discovery phase for project scoping and requirement analysis. My first step is to identify all activities aka processes in the e-commerce value chain as described above. Then I try to identify who are the people involved in those processes and the technology (aka IT systems) required to perform those processes. As a matter of fact, people, processes and technology are the key components underlying e-commerce operating model. And a thorough analysis of the as-is and to-be operating model will help both system implementors and clients understand how e-commerce operations are structured across the e-commerce value chain to effectively deliver and execute on the organization's e-commerce strategy. In the discovery phase, knowing who are the required stakeholders for different topics is important to effectively conduct discovery workshops. As different people will participate in different sessions, I believe it's extremely important to properly structure the conversations around the value chain so that participants know exactly where they fit in the entire e-commerce value chain and the context behind workshop discussion. With the exhaustive list of processes identified upfront in value chain analysis, I feel a lot more confident that I will get all ground covered which minimizes scope creeps and change requests during build phase that can make adverse impacts on quality and schedule especially for projects with a tight timeline. And when deep diving into each and every process in workshops, knowing exactly what Episerver can provide out of the box, the discussions will shape what needs to be customized. Needless to say but when going through the value chain, you will appreciate the comprehensiveness of Episerver Commerce which provides a solid foundation to build powerful and flexible e-commerce systems. It's worthy to note that e-commerce implementation typically involves a number of external systems besides Episerver. Therefore, tagging systems to each process in the value chain would yield a complete list of external systems and the required integration touch points as I outlined in another blog post on Episerver Commerce integration. In other words, value chain analysis would unravel integration requirements and minimize the risk of having disconnected systems. Interestingly, value chain analysis can be used not only for project scoping and requirement analysis as described in the previous section but also for driving digital transformation programs. For example, value chain can be used to visualize pain points and areas for improvement in forms of heatmaps, especially in brownfield implementation. In my opinion, heat mapping is an effective tool for internal communications to build awareness for change from project inception till go-live. In other words, value chain analysis helps clients and system implementors run change management program more effectively which is one of the success factors for Episerver Commerce implementation. Value chain analysis can also be used to identify activities that add or improve customer value and the best opportunities for differentiation. Those differentiators can be within general, discrete functions or those with interactions and cross-functionality between processes in the value chain. For instance, through value chain analysis, one of my clients figured out the fact that they can bring great benefits to their customers who are interested in top-sellers by connecting product inventory and back-order fulfillment. And we successfully implemented that differentiator by with wiring logic between Episerver inventory service and order management. As mentioned above, value chain analysis is a powerful tool in management consulting but can be extended for use in Episerver Commerce implementation throughout the project lifecycle especially for discovery and change management. From my own experience, I found that e-commerce value chain analysis was really instrumental in the success of my past e-commerce projects, and more importantly, my clients really liked it. If you think value chain analysis might be useful for your projects, please try and let me know your thoughts.